Welcome to the nutritional vitamin b6 content in 14 different types of cherries, ranging from 0.067 mg to 0.022 mg per 100g. The basic type of cherries is Cherries, sweet, raw, where the amount of vitamin b6 in 100g is 0.049 mg.
0.049 mg of vitamin b6 per 100g, from Cherries, sweet, raw corresponds to 2% of the vitamin b6 RDA. For a typical serving size of 1 cup, with pits, yields (or 138 g) the amount of Vitamin B6 is 0.07 mg. This corresponds to an RDA percentage of 4%. The percentage of the recommended daily allowance (RDA) for vitamin b6 is based on a 2 mg RDA level for a mature adult. Below is a summary list for the top ten cherries items ranked by the amount or level of vitamin b6 in 100g. Following on from the ten top cherries items or products containing vitamin b6 we have a more comprehensive break down of Cherries, sweet, raw, and the highest item containing vitamin b6 which is Cherries, sour, red, frozen, unsweetened. We also give a comparison of average values, median values and lowest values along with a comparison with other food groups and assess the effects of storage and preparation on the 14 types of cherries. At the bottom of the page is the full list for the 14 different types of cherries based on the content in different servings in grams and oz (and other serving sizes), providing a comprehensive analysis of the vitamin b6 content in cherries. The full nutrition content, RDA percentages and levels for Cherries, sweet, raw should be considered along with the vitamin b6 content. This food profile is part of our list of food and drinks under the general group Fruits and Fruit Juices.Other important and vitamin b6 related nutrients are Calories, Protein, Fat and Carbohydrate. For this 100g serving in your diet, the amount of Calories is 63 kcal (3% RDA), the amount of Protein is 1.06 g (2% RDA), the amount of Fat is 0.2 g and the amount of Carbohydrate is 16.01 g (12% RDA). The nutritional content and facts for 100g, which includes Calories, Protein, Fat and Carbohydrate is shown in the RDA chart below as percentages of the recommended daily allowance along with the vitamin b6 levels in cherries. Our proprietary nutritional density score gives a nutritional value out of 100 based on 9 different vitamins, minerals and macro nutrients. Cherries, sweet, raw has a nutritional value score of 16 out of 100.Comparing the vitamin b6 content and the nutritional density in 100g for Cherries, sweet, raw; We class this as a medium to low vitamin b6 content item.In terms of overall nutritional value we class this as an item with a medium nutritional density value. 100 calories of cherries, sweet, raw is a serving size of 1.59 g, and the amount of Vitamin B6 is 0.08 mg (3.17% RDA). Other important and related nutrients and macronutrients such as Fat, in 100 Calories are as follows; Protein 1.68 g (3.17% RDA), Fat 0.32 g (0% RDA), Carbohydrate 25.41 g (19.05% RDA). This is shown in the vitamin b6 RDA percentage chart below, based on 100 Calories, along with the other important nutrients and macro nutrients. For the food Cherries, sweet, raw the typical serving size is 1 cup, with pits, yields (or 138 g) which contains 0.07 mg of Vitamin B6. The vitamin b6 percentage of the recommended daily value for this serving is 4 %. To give 100% of the RDA, 25.0 servings of the typical serving size 1 cup, with pits, yields (or 138 g) give the complete RDA. In terms of the gram weight and total content for this serving the Calories content is 86.94 kcal, the Protein content is 1.46 g, the Fat content is 0.28 g and the Carbohydrate content is 22.09 g. The percentages are shown below in the vitamin b6 chart, for the typical serving of vitamin b6 and the related and important nutritional values. The amount of protein, fat and carbs from this food described above is measured in grams per 100g and grams in a typical serving size (in this case 1 cup, with pits, yields or 138 g), although it is also useful to give the number of calories from protein, fat and carbohydrate which are the most important macronutrients. For this serving in your diet here are the macronutrient calories. From protein the number of calories is 4.9 (kcal).The number of calories from Fat is 2.3 (kcal).The total calories from carbohydrate is 79.5 (kcal). This list of 14 types of cherries, is brought to you by www.dietandfitnesstoday.com and ranges from Cherries, sour, red, frozen, unsweetened through to Cherries, sweet, canned, pitted, heavy syrup, drained where all food items are ranked by the content or amount per 100g. The nutritional vitamin b6 content can be scaled by the amount in grams, oz or typical serving sizes. Simply click on a food item or beverage from the list at the bottom of the page to give a full dietary nutritional breakdown to answer the question how much vitamin b6 in cherries. The list below gives the total vitamin b6 content in the 14 items from the general description 'cherries' each of which show the vitamin b6 amount as well as Calories, Protein, Fat and Carbohydrate. Below, is the top 14 food items shown in the vitamin b6 chart. This gives a quick and easy dietary comparison for the different items, where each item is listed at the bottom of the page with a nutritional summary. The corresponding nutritional value for cherries based on our density score out of 100 (ranked by the amount of vitamin b6 per 100g) is shown in the below nutritional density chart. The corresponding Calories for cherries ranked by the amount of vitamin b6 per 100g is shown below in the cherries calories chart. The level of vitamin b6 can be affected by the method of storage for example canned or frozen and also by the method of preparation for example either raw, cooked or fried. The total number of frozen food items is 2. The highest amount of vitamin b6 from the 2 frozen items is in Cherries, sour, red, frozen, unsweetened where the vitamin b6 content is 0.067 mg per 100g. The number of food items classified as canned is 10 items. The highest amount of vitamin b6 from the 10 canned items is in Cherries, sour, red, canned, water pack, solids and liquids (includes USDA commodity red tart cherries, canned) where the level is 0.044 mg per 100g.The total food items which are raw is 2 items. 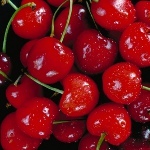 The highest amount of vitamin b6 from the 2 raw items is in Cherries, sweet, raw where the content is 0.049 mg per 100g. The average (or more correctly the arithmetic mean) amount of vitamin b6 contained in 100g of cherries, based on the list below of 14 different items under the general description of cherries, is 0.04 mg of vitamin b6. This average value corresponds to 2 % of the recommended dietary allowance (or RDA) in your diet. The averages for the different nutrients are as follows; the average amount of Calories is 71.36 kcal, the average amount of Protein is 0.81 g, the average amount of Fat is 0.16 g and the average amount of Carbohydrate is g.
The median value of Vitamin B6 is found in Cherries, sour, red, canned, extra heavy syrup pack, solids and liquids which in 100g contains 0.044 mg of Vitamin B6. This corresponds to 2 % of the recommended daily allowance. For this serving the amount of Calories is 114 kcal, the amount of Protein is 0.71 g, the amount of Fat is 0.09 g and the amount of Carbohydrate is 29.23 g.
Using the list below for the 14 different cherries nutrition entries in our database, the highest amount of vitamin b6 is found in Cherries, sour, red, frozen, unsweetened which contains 0.067 mg of vitamin b6 per 100g. The associated percentage of RDA is 3 %. For this 100g serving the Calories content is 46 kcal, the Protein content is 0.92 g, the Fat content is 0.44 g, the Carbohydrate content is 11.02 g.
The lowest amount of vitamin b6 in 100g is in Cherries, sweet, canned, pitted, heavy syrup, drained which contains 0.022 mg. This gives as percentage of the recommended daily allowance 1 % of the RDA. For this 100g serving the amount of Calories is 83 kcal, the amount of Protein is 0.73 g, the amount of Fat is 0.21 g, the amount of Carbohydrate is 21.07 g.
The difference between the highest and lowest values gives a vitamin b6 range of 0.045 mg per 100g. The range for the other nutrients are as follows; 37 kcal for Calories, 0.19 g for Protein, 0.23 g for Fat, 0 g for Carbohydrate. Please remember that the above gives an accurate value in 100g for high vitamin b6 foods in your diet. For example 100g of Cherries, sweet, raw contains 0.049 mg of vitamin b6. However, there are other factors to consider when you are assessing your nutritional requirements. You should also take into account portion sizes when you are considering the vitamin b6 nutritional content. The food with the highest vitamin b6 content per typical serving is Cherries, sour, red, canned, extra heavy syrup pack, solids and liquids which contains 0.11 mg in 1 cup (or 261 g). The percentage of the recommended daily value for this serving is 6 %. For this serving the Calories content is 297.54 kcal, the Protein content is 1.85 g, the Fat content is 0.23 g and the Carbohydrate content is 76.29 g.
From the list below you can find a full nutrition facts breakdown for all foods containing vitamin b6 which can be scaled for different servings and quantities. We have also sorted our complete nutritional information and vitamin database of over 7000 foods, to give a list of vitamin b6 rich foods. Disclaimer: The information provided by Diet & Fitness Today is for general information and should not be used during any medical emergency or for the diagnosis or treatment of any medical condition. You should always consult a licensed physician or medical professional for diagnosis and treatment of any medical condition and before starting any weight loss or fitness regime. Copyright © 2005-2019 Bodyventures. All Rights Reserved. Any duplication or distribution of the information contained herein is strictly prohibited.